The first few flakes have fallen on Albany’s ground, and for some of us that brings happiness and for others it brings on a depression. Anyone from Western New York (i.e. Buffalo, Rochester, Syracuse) knows what I’m talking about when I say that Albany doesn’t know what snow is. My freshman year here at Saint Rose, I remember people getting so nervous and upset because the weather forecast called for a couple of feet of snow. Everyone kept telling me that classes were going to get cancelled, but I thought they were just joking. Cancelling classes over a few inches of snow? That would never happen at home. In Rochester, we are used to getting 2-3 inches per hour sometimes when we get lake effect snow off of Lake Ontario. When I was in high school, we knew that in order for school to get cancelled, it would have to start snowing during the early hours of the morning (3 or 4am was the prime time); Just in time to catch the plows when they’re not in service yet. Even then, it would take a solid 3-4 feet of heavy snow before school would be cancelled. Now you see why I laughed at my friends. However, I soon received a notification from the Saint Rose RAVE system saying that all classes were cancelled for the rest of the day! 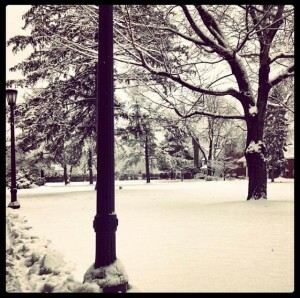 The Saint Rose campus quad is so beautiful in the winter! So, while you may hate the snow, and you may hate the cold, it’s a little comforting to know that snow can occasionally help you out by possibly cancelling or delaying your classes! Get your boots and winter coat out! Winter is here to stay!